We like independent traders, specially those that are a bit different or even odd. Small set-ups doing interesting things with one eye on their ethics, the other on their speciality, the other one their customers in the style of a benevolent, entrepreneuring tri-clops. Well, our friends over at Qype are down with them too and have created the Hidden Gem Awards to celebrate them, to culminate in a "glitzy awards ceremony" later this year. It's at nomination stage at the moment so we urge you to go and have a look and nominate your favourite London places. There's definitely one we want to nominate but we'd be accused of nepotism if we shouted about it too much. It's not even on Qype yet (soon will be...). There are a number of categories to nominate in and we'll definitely be keeping a close eye on the 'best place for a Sunday roast' noms, given our own recent foray into regular roast potato seeking. Support your local traders. Reveal your hidden gems! We'll be back to analyse the shortlist when it's ready. 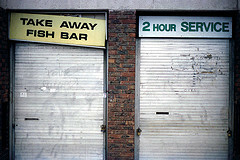 S L O W F O O D image by D I C K S D A I L Y via the Londonist Flickr pool.